Skydive Dubai has only recently finished staging the World Parachuting Championships, but already, they’re back hosting another big event. World record holding skydiver, Olav Zipser, completed his 21,000th jump today at Dubai Marina, and we were there. Olav Zipser is one of the world’s most experienced skydivers. He’s devoted a lifetime to parachuting, and between his first jump, in 1986, to now, he had leaped from a plane 20-thousand, 900 and 99 times. Until today. “I’m doing my 21,000th flight, from the sky, here over Dubai and we’re going to be landing here in this landing area,” says Olav. Olav’s professional highlights are not only measured in numbers either. He’s mastered just about every aspect of this discipline there is. He’s a qualified instructor, examiner, safety expert and awardwinning mid-air cameraman. He’s set up his own freeflying school and is actively involved in pushing the boundaries to their limits and beyond, with groundbreaking research on the potential for human flight. So in a career that has seen him jump in beautiful locations all around the world, why is the UAE such a special place for Olav? “I like the spirit here, of Dubai because it’s a growing city there’s a lot of people from all over the world,” he says. So 21,000 jumps, what now? 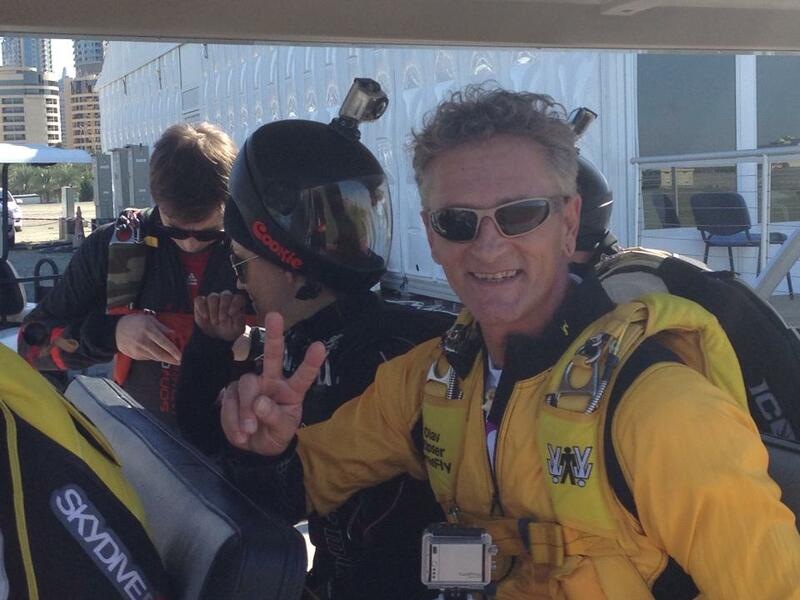 The only question that remains now is whether Olav will join us for his 22,000th jump. Noni Edwards, Emirates News. This entry was posted in Uncategorized and tagged dubai, emirates news, olav zipser, skydive dubai, skydiving. Bookmark the permalink.